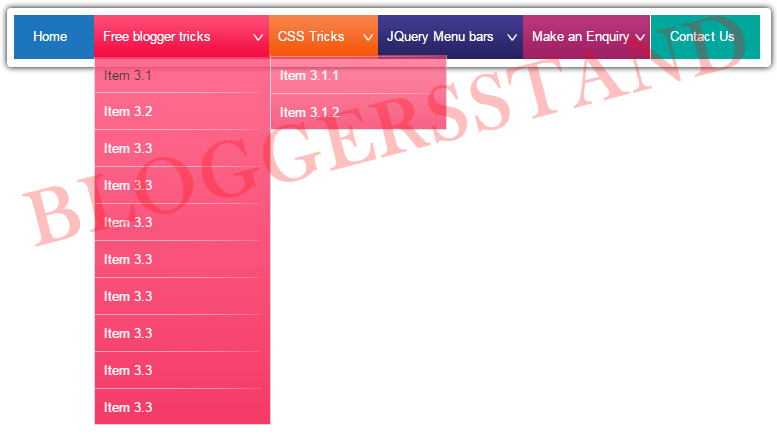 Jquery Unique Colorful Drop Down Navigation Menu Bar | BloggersStand ';-1!=b.indexOf("img.youtube.com")&&(a=' ');d=a+''+p+''+titlex+"
In this tutorial i'm going to explain how to add unique colorful jquery navigation menu bar for blogger.There are lot of jquery menu bars available on internet but this one is unique because i foucsed on making colorful and user friendly,it will give attractive look to your blospot blog or website.just follow the steps mentioned below to grab this unique colorful hover style navigation menu bar. 3. Paste below code just above it. 5. paste below code just above it. 6. Now save your template. Note: Replace # with your urls. 0 Comments on "Jquery Unique Colorful Drop Down Navigation Menu Bar" So Far - Post Yours!